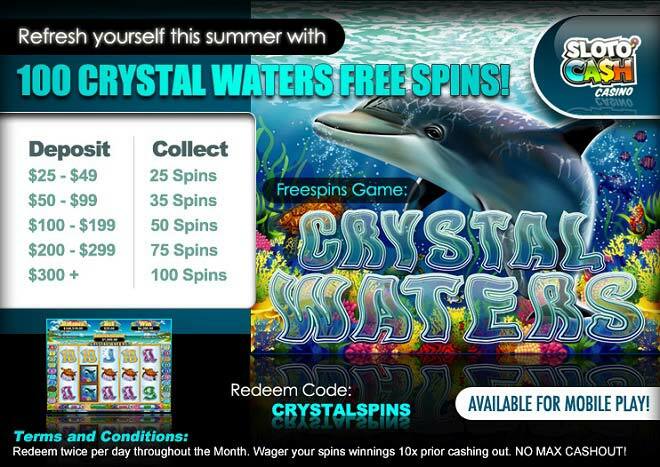 Cool Off During the Warm Weather With 100 Crystal Water Free Spins! Summer is certainly here and we want to welcome the warm weather months by giving you the chance to cool off right from the start with your deposits of as little as $25 and a chance to collect up to 100 Crystal Water Spins! Time to dive deep into an ocean of winnings when you play Crystal Waters with free games, scatter symbols, wilds and multipliers! Land three of the Yacht Wild symbols to trigger 15 free spins, win up to 4000x your wager when you land the correct Dolphin/Sea Turtle combination and more! Get into the weekend summertime groove with the help of up to 100 Crystal Water Spins when making a deposit of as little as $25! 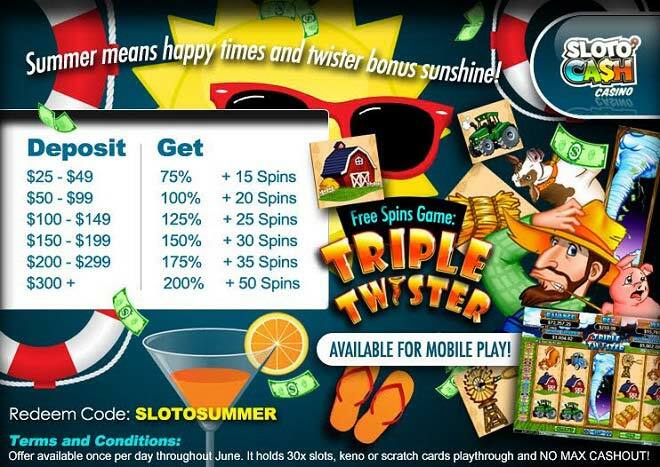 As we wave goodbye to May and usher in the first days of summer we like to thank you for all your recent action and thought there couldn't be a better way to good bye May than with 50 Extra Added Spins to catch $500 in Extra Cash! We are very looking forward to the month of June and a start of summer with much excitement and fervor. The warm months ahead have gotten us in the mood to do even bigger and better things for our players who have given us their constant loyalty throughout these few months of 2015. Stay tuned for our Summer Kick Off offers coming on June 1st with 15 Free Spins and a MASSIVE Summer Kick Off Match Bonus + 50 EXTRA SPINS!